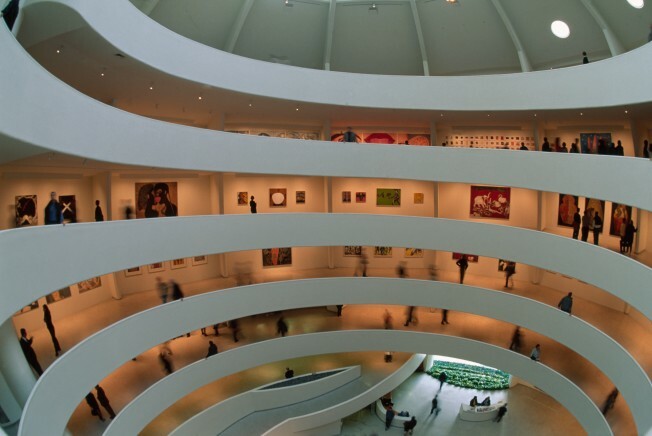 A few lucky New York art lovers can now sleepover at the Guggenheim Museum. Spending a night in the museum isn't just the stuff of movies and books these days as both the Guggenheim and American Museum of Natural History are accepting overnight guests this fall. The Guggenheim is allowing one couple per night to sleep in the “Revolving Hotel Room” exhibit designed by artist Carsten Holler as part of theanyspacewhatever exhibition. Not only do guests get use of the bed, dresser and table for the night, they get to "enjoy the exhibition by themselves," museum curator Nancy Spector said. When the Guggenheim announced plans for the exhibition, they were flooded with more than 500 calls and quickly booked up all 50 nights they had open. Actress Chloe Sevigny was the guest on the first night. But museum sleepover spots are still open across the park, where you can get a cot under the famous big blue whale. The American Museum of Natural History has opened up new dates for its sleepovers, which are targeted to children in the 8- through 12-year-old range -- plus a chaperone. The price is $129 per person. Overnight guests get to explore the museum by flashlight, from dinosaurs to elephants and everything in between. They'll get to do some fossil exploration, watch an IMAX movie, eat dinner -- and then try to sleep. Spaces are still available for the November 8 and December 13 sleepovers.